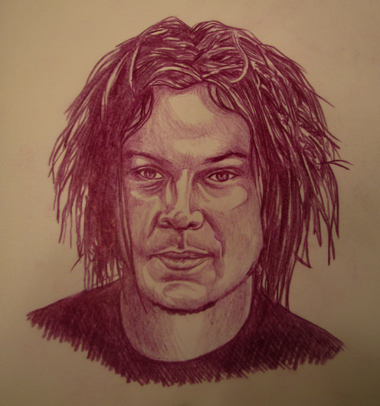 Jack White drawing - Purple Prismacolor® pencil on paper. When artists talk about the creative process and how important that feeling of "inspiration" is I tend to mentally roll my eyes. I know plenty artists who wait for that "special feeling" of inspiration before they begin a project. Consequently those artists tend to have very little to show. They're also the individuals who freeze when staring down a blank piece of paper of canvas. I've always believed discipline creates its own inspiration. So, again, I was surprised that Jack White shares very similar views on the creative process. "I mean, not every day you’re going to wake up and the clouds are going to part and the rays from heaven are going to come down and you’re going to write a song from it. I mean, sometimes you just get in there and force yourself to work and maybe something good will come out of it. But that was one of the things, it was like whether we like it not, we’re going to write some songs and record. You know, force yourself into it. Book only four or five days in the studio and force yourself to record an album in that time. Deadlines and things make you creative. Opportunity and telling yourself “Oh, you have all the time in the world, you have all the money in the world, you have all the colors in the palette you want, anything you want,” I mean, that just kills creativity." I agree with you about waiting for inspiration, but then I feel like creating is my "job" that I get up and go to every day, and only have time off when I am sick or on vacation. It takes discipline to "grow" and develop skills, style. I guess it depends on how seriously one considers themselves an artist. I mean, so many of the artists I have met online are really hobbiests. I will admit that I depend on good energy when it comes to creating, there are times when if I force myself to work, I WILL ruin something. So, then, its clean the studio day.